Tag Archive | "Red Flannel Factory"
Clara Jo Gust, 94 of Cedar Springs, passed away peacefully Saturday, April 25, 2015 at Sanctuary at St. Mary’s. 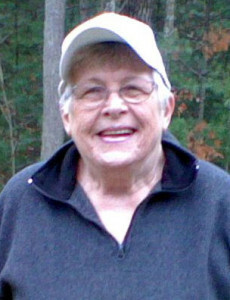 Mrs. Gust was born March 28, 1921 in Ovid, Michigan, the daughter of George and Nellie (Lockwood) Sillaway. She graduated from Cedar Springs High School, Class of 1939 as Salutatorian. She was a member of the United Methodist Church and had worked at Pollocks Department Store and the Red Flannel Factory. She was an avid golfer, bowler and bridge player. She enjoyed traveling and spending time in Florida, was a wonderful mother and had a special love for her grandchildren and great grandchildren. Surviving are her children, Gary (Lolly) Gust, Joanne Gust; son-in-law, Tom Finch; grandchildren, Jeff (Barb) Gust, Michelle Tackmann, Elissa Hughes & Mike Mondy, Zachary (Connie) Hughes, Zeke (Mandy) Finch, Brianna (Garry) Genao; great grandchildren, Jason, Brooke and Jacob Gust, Isabelle Tackmann, Afton Glynn, Elizabeth and Annabelle Finch; several nieces and nephews. She was preceded in death by her daughter, Beverly Finch; six brothers and sisters. The family will greet friends Tuesday, June 9, at 10:00 am until time of service at 11:00 am at the Bliss-Witters & Pike Funeral Home, Cedar Springs. Pastor Steve Lindeman officiating. Interment Elmwood Cemetery, Cedar Springs. Memorials may be made to Susan G. Komen, 3949 Sparks Dr. SE, Suite 100, Grand Rapids, MI 49546. Bonnie Miller, age 74, of Howard City passed away April 21, 2015 at her residence. She was born February 6, 1941 in St. Johns the daughter of George and Bonnie (Ward) Comer. During her working years she worked as a Avon Rep for many years. She also worked at the Dime Store and Red Flannel Factory in Cedar Springs. She enjoyed computer games, gardening, sewing and going to the casino. In 1973 she married James who survives. Also surviving are four children, Norman(Katie) Miller of Orleans, Tammy (Al) Haskins of Howard City, Melissa Eerdmans of Belding, Helene (Louis) Hall of Cedar Springs; 15 grandchildren and many great-grandchildren and several nieces and nephews. She was preceded in death by her parents and a daughter Brenda. Private family services will take place at a later date.